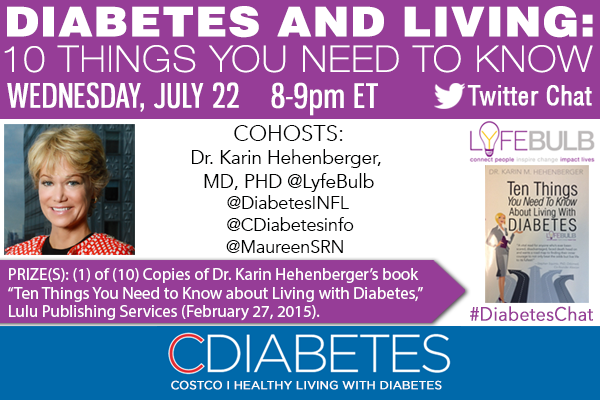 In July, 2015, Dr. Karin Hehenberger, MD, PhD, joined CDiabetes.com for a tweet chat about living with diabetes. Dr. Hehenberger is a leading expert in the medical and business aspects of the biopharmaceutical industry, with over 15 years in leadership positions at JNJ, Eyetech Pharmaceuticals, Coronado Biosciences, and hedge funds Brummer & Partners and Scandinavian Life Science Ventures. Dr. Hehenberger received her MD and PhD at the Karolinska Institute in Stockholm, Sweden, where she retains a position with the Department of Endocrinology and Surgery. She did her post-doctorate work at the Joslin Diabetes Center, Harvard Medical School, and served on the senior team at the JDRF. How can I maintain a stable blood sugar level in the morning? “Dawn phenomenon” is an increase in hormone production from about 2 to 8 AM. The hormones increase insulin resistance and tell the liver to make enough glucose to start the day. For people without diabetes, insulin levels increase to handle the extra glucose, but people with diabetes can’t increase insulin levels that much, so their early morning blood glucose levels can rise dramatically. You can also help maintain your morning blood sugars by adapting your eating habits. A high-protein, low-carb snack before breakfast helps reduce post-breakfast hypoglycemia. Then eat a breakfast with protein, healthy fat, and a small amount of slow-digesting carbohydrates – not croissants, toast, jams or pastries. Oatmeal, berries or plain yogurt with nuts and berries will last you longer and keep you from getting hungry. Some people say to avoid late night snacks, but others recommend a protein snack before bed. Keep a food journal and see what works best for you. Will diabetes affect my work life? Diabetes does not have to affect your work life in a negative way, but you do have to make sure that work does not get in the way of proper nutrition. Don’t skip meals or eat poorly because of the schedule or stress. It’s a good idea to let the people close to you know you have diabetes so that they can intervene if you need some food quickly. Long work hours, erratic schedules, travel, and unscheduled meetings can cause glucose levels to fluctuate. Preplan as much as you can. An insulin pump can make life easier, and you should have “to go” foods available for the unexpected lunch time pizza meeting. If you have a job that requires manual labor, be extra careful and monitor your blood sugars frequently. The Americans with Disabilities Act makes it illegal to discriminate in the workplace against someone with diabetes. Know your rights. Check your blood sugar, keep snacks at your desk and handle on-the-job stress that can raise your blood sugar. Good sources of carbohydrates are varied; the most important thing is to get a working knowledge of label reading and portion control. Look for natural, organic, unprocessed foods that have a low glycemic/insulin index. Oatmeal, multigrain bread, brown rice, whole grain crackers, fruits, veggies, low-fat dairy and beans are all good. Avoid Grapes, white rice, white pasta, pastries and sweets. Does the type of exercise I do affect my blood sugar levels? All types of exercise affect blood sugar levels. From walking to running, all cardio-vascular activity burns carbs and reduces blood sugar levels. Lifting weights and anaerobic exercise, however, will actually raise blood sugar levels. The more intense and calorie burning the exercise is, the more your insulin resistance will be reduced and your sugar levels will drop. So when you exercise, check your blood sugars beforehand, and have quick acting glucose available just in case. Aim for progress, not perfection, when starting any exercise regimen. And get medical clearance if you need; in addition to blood sugar, exercise can affect your prescribed medications. What devices are in the works for better diabetes care? Diabetes care devices currently being developed include: a Nanofiber Sensor which attaches to a smart phone; the closed loop, an insulin pump which will deliver insulin contingent upon the glucose levels measured by a second (connected) device; inhaled insulin devices; an insulin patch; smaller, more accurate pumps and machines to measure sugar continuously; cellphone applications that record readings from glucometers. 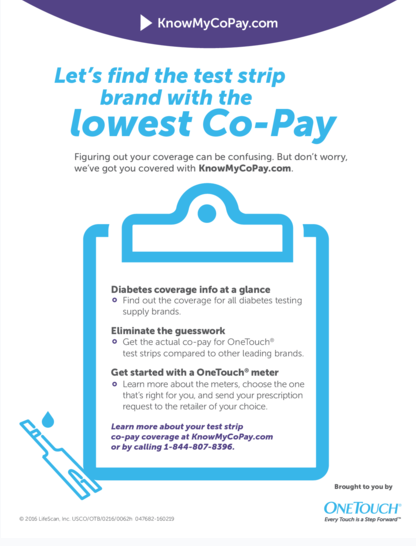 If you can’t afford the cost of your diabetes supplies, many options exist for partial coverage or free supplies. Check your medical supply company’s “PAP” – patient assistance programs. My loved one was just diagnosed with diabetes – what can I do to be more supportive? First, don’t panic. Ask them how they would like you to support them. They are the experts on what works for them. Seek professional help from your MD and a dietitian to plan their care. Connect with the closest and best diabetes clinic, and make sure the person gets treatment, education and counseling. Family-centered education is paramount, so get everyone on “same page.” Understand as much as possible yourself so you can be genuinely helpful. Study the literature and reach out to a patient community, such as Lyfebulb, to meet others with a similar story. Understand that this is a chronic, yet manageable disease. Talk about your relative’s fears and concerns. 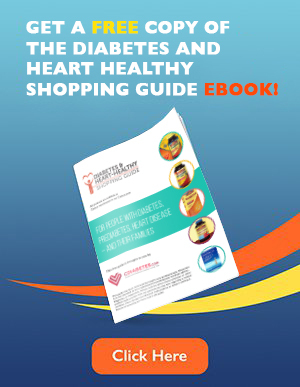 Assure them that diabetes can be managed with diet, exercise and medication (if needed). Avoid, saying things like “are you sure you should be….” You might mean well, but it comes off as judgmental. And never say, “Can you eat that?” It’s unsupportive. How about just offering a tasty, healthy alternative instead? Finally, don’t discount diabetic related depression and burnout – for your relative or for you. 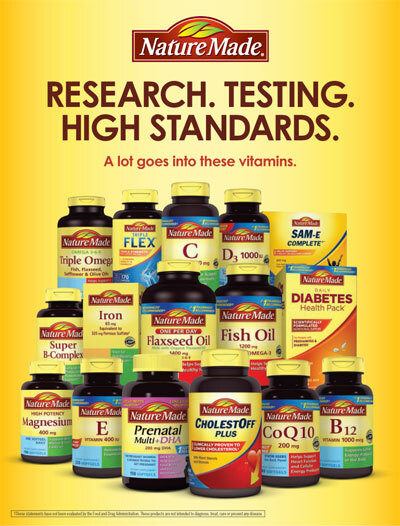 Treating diabetes can be overwhelming. Seek help for yourself if needed. Why is diabetes more common worldwide? The worldwide epidemic of diabetes has many factors: genetics, environmental causes, and changes in diet and activity over the years. Technology has created a world where exercise is an option instead of a natural part of life. Add to that a lack of proper nutrition and bad food habits that lead to obesity. Chemicals in foods lead to mutations in the gene pool. Additionally, more people are aware of Type 2 diabetes, so cases that previously would have been overlooked are now being diagnosed. Type 1 diabetes is trickier. This is an autoimmune disease, and instances of all autoimmune diseases are growing in numbers. Invest in yourself through exercise, meditation, cooking and learning how to manage your diabetes. Learn as much as possible about your disease. Learn from others in similar situations as well as from the literature and from thought leaders. Find support groups, do your research and get educated in self-care, a balanced diet, and how to improve your overall health. Don’t forget to nourish your spirit in whatever manner you choose. What are the latest scientific advances for treating diabetes? Insulin is still the primary treatment for Type 1 diabetes, but better delivery methods are coming to the market, including smart phone apps to help with management, and a rapid-acting insulin that enters the blood very quickly. Other advances promise better continuous delivery, inhaled insulin, better glucose measuring devices, advanced pumps and even a bionic pancreas. There are exciting times ahead. In development there are also so-called “therapeutic vaccines,” which can be used to prevent full-blown diabetes, and at least two kinds of glucose responsive insulins. There are also a number of immune therapies to protect the pancreas. Eating out, drinking, parties – how do I balance diabetes and a social life? The keys to balancing diabetes and a social life are moderation and planning ahead. If you’re eating at a restaurant, check their menu online. Order side dishes in lieu of calorie-rich appetizers, and ask to have the starch removed from a heavy main course. Avoid rice, potatoes and bread. Watch out for sauces and dressings that may be full of sugar and cream, and don’t drink soda. If you’re going to a friend’s house, ask what is being served, or bring a dish that you can eat. And if it’s a buffet, dance and socialize and stay away from temptation. Focus on high-protein, low-carb appetizers and entrees. You can have alcohol, but limit yourself to 1 glass of wine and never drink without having something to eat to avoid your blood sugar going too low later. And remember, your social life doesn’t have to be just “about the food;” enjoy the company and the moment. For the full transcript, go to http://cdiabetes.com/twitter-chat-transcript-diabetes-and-living-10-things-you-need-to-know-july-22-2015/.